It wasn't the most auspicious development for a company that's getting ready to sell stock to the public. Since content mill Demand Media Studios last Friday filed its intentions to offer an Initial Public Offering of stock later this year, traffic at its website has dropped. What could have caused the 71 percent traffic drop? Some Demand Media watchers point to a nugget of information in the company's IPO filing. That nugget, listed in the "risk factors" investors should consider before throwing dead presidents at Demand Media is possible competition from Google. That would be a big blow to Demand, which depends on Searchzilla for a quarter of its revenue through cost-per-click keyword advertising. Demand Media acknowledged in its IPO filing that Google's access to billions of searches could give it a competitive advantage over Demand Media should the search firm enter the content generation business. Demand Media's business model calls for marshalling armies of creatives to produce articles, photos, and videos for its website. Demand Media uses an algorithm to identify hot trends on the Internet and steer its creatives to produce content for those trends. It creates revenue from keyword-related advertising tied to the content. And since the content is tied to hot trends, it collects top dollar from advertisers hungry to tap into those trends. That competition may have already began, according to one Demand Media watcher, who suggests that Google is tinkering with its search algorithm to deflect traffic away from Demand. "The massive drop-off occured a few days prior to the IPO filing, and has stayed consistent over the past two days of Quantcast reports," observes Dan Primack. 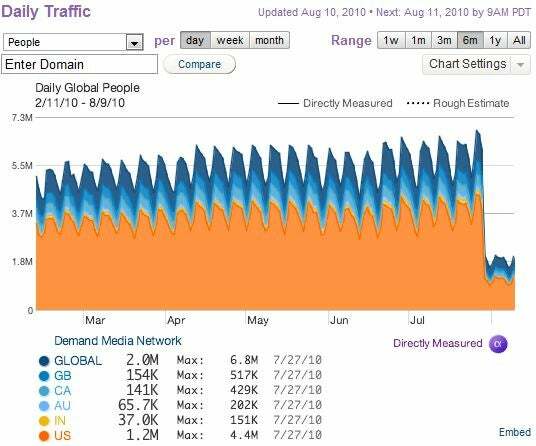 "It certainly could be an error the fall is not mirrored by indirect" traffic analytics groups Compete or Alexa but let me offer an alternate (and unsubstantiated) theory: Google changed something in its search algorithm to lower the demand for Demand." Between this dubious conspiracy theory about Demand Media's drop in traffic and Google's dalliance with Verizon this week, it's enough to raise questions in some minds as to whether or not the search giant has gone over to the "dark side."